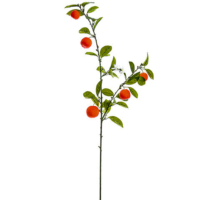 One of the realistic looking artificial fruits that you can buy from our collection. Amazing Produce carries a variety of artificial fruits in our collection including artificial mandarin. Above all, our mandarin looks perfectly real and great among fruit and vegetable displays. You do not have to look further when you have Amazing Produce for your fake fruit and fake vegetable needs. Our artificial mandarin looks real. This is a gorgeous leafy and realistic fruit spray. Perfect for creating a garden themed event. Available in the perfect color and shape. As a result, customers can buy this fake mandarin and be completely satisfied with the quality of the product. In conclusion, order this realistic looking mandarin from our collection as it is the best available fake mandarin. Made with top quality material.